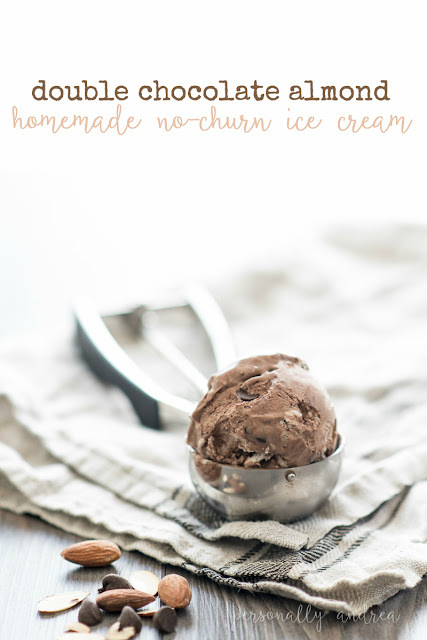 This homemade no-churn ice cream contains two kinds of chocolate and toasted almonds for truly rich and decadent treat, perfect for summertime, long weekends, or anytime dessert! With the first long weekend of the summer upon us, it’s time to start stocking the freezer with cool treats. Did you know how easy it is to whip up a batch of homemade ice cream? No ice cream maker required and only two ingredients... plus any and every kind of flavours you want to add. This is my latest favourite. 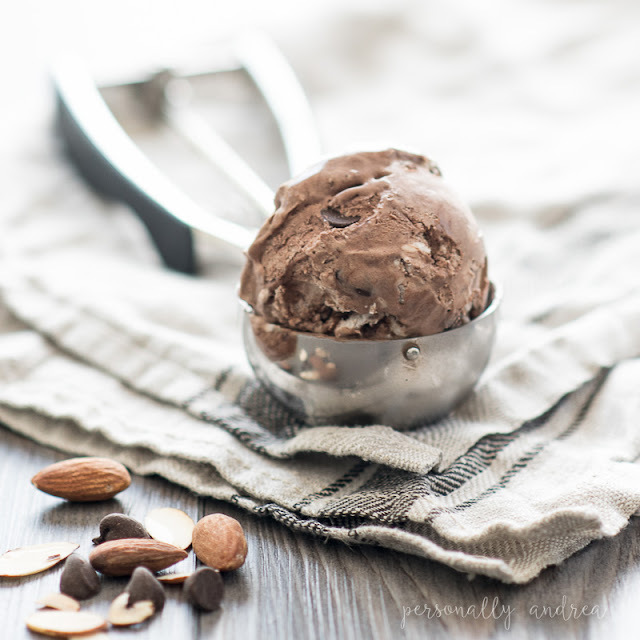 Double Chocolate Almond. If you’re a fan of Jamoca Almond Fudge at Baskin Robbins this one’s for you! It’s harder to find true ice cream at the supermarket anymore, in the huge assortment of other “frozen desserts” that mimic ice cream, but aren’t the real deal. Making your own at home gives you control over the ingredients and eliminates any unwanted additives and preservatives… but not much control over the calories… #sorrynotsorry. For a base recipe, there are lots available on pinterest. I generally follow this one from Love Grows Wild, except using metric quantities which is what we have available here in Canada: 473mL heavy cream or whipping cream (approximately 2 cups) and 300 mL sweetened condensed milk (approximately 1 1/4 cups). Plus the seeds of one vanilla bean or a half teaspoon of good vanilla extract. 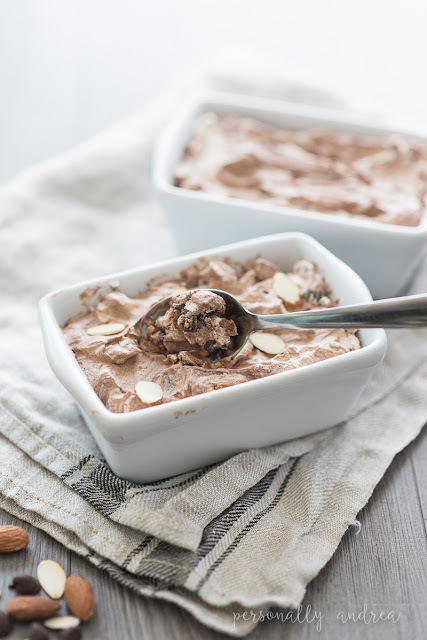 For this double chocolate almond flavour I mixed half a cup of sifted cocao powder into the condensed milk and scraped the vanilla bean seeds into the mixture. Whip the heavy cream for a couple of minutes in a stand mixer until soft peaks form. 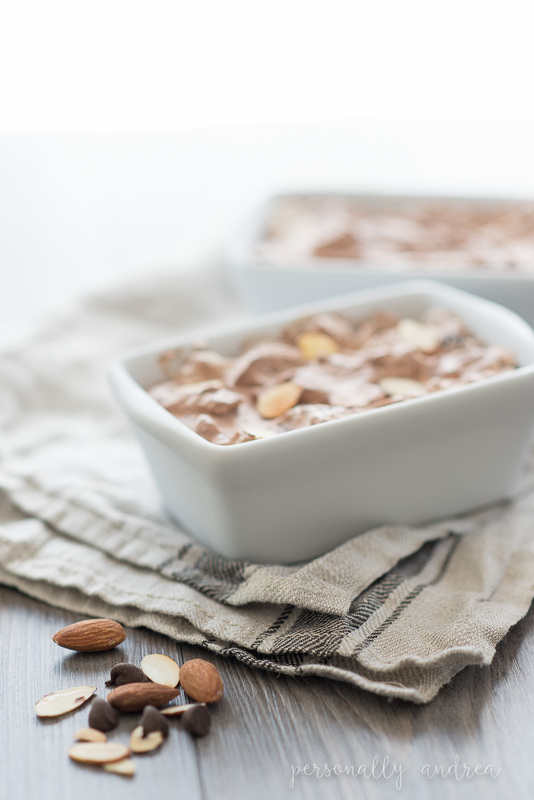 Fold in the condensed milk mixture, half a cup of chocolate chips and a half cup of toasted almond slices until barely combined. One recipe makes enough ice cream to fill a large loaf pan. Cover with plastic wrap and let freeze for about six hours. I like to freeze it in mini loaf pans, or even individual serving mason jars. Because I’m impatient and it freezes faster that way. And it’s cute. I had a bit of practice photographing ice cream last summer with Melissa at Sweet Escape who got all excited and made nine flavours at once. So for more yummy flavours check out that epic post. 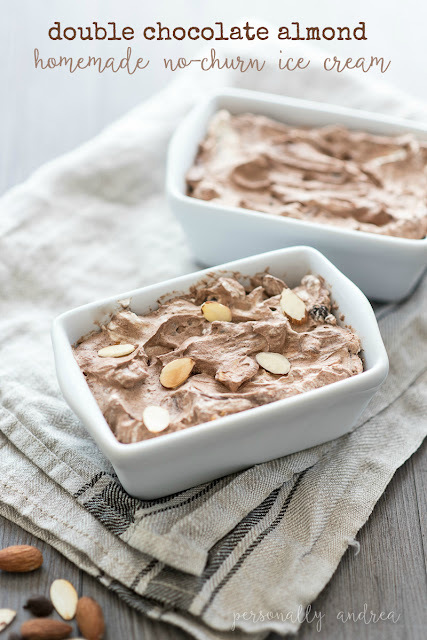 In a medium bowl combine condensed milk, cocao powder and vanilla. In a stand mixer, whip the cream until soft peaks form. With a spatula gently fold the condensed milk mixture, chocolate chips and almonds into the whip cream until barely combined. Transfer to a freezer safe container, cover and let freeze for six hours. Enjoy!